The session was provided by Jessica Mintz and Michael Shanzer who had attended a workshop provided by the Alan Alda Center for Communicating Science through the New York State Master Teacher Program. The Alan Alda foundation works with scientists and professionals to take their complex knowledge and communicate it with others so it is comprehensible, clear and engaging. The session was great in that it explored new ways of communicating science concepts in a collaborate and creative way. One of my favorite activities was called “Yes, and…” In this activity the two participants engage in a back and forth through conversation and build off of one another’s idea. The initial prompt at the session I attended was, “I heard that you are applying to NASA to become an astronaut.” The participant had to reply by saying, “ Yes and...and then..." following it up with something on the spot. The two went back and forth for a few minutes. I decided to try this with my students for a recent unit on the periodic table. We first modeled how the improv technique works with the same starter about the astronaut. 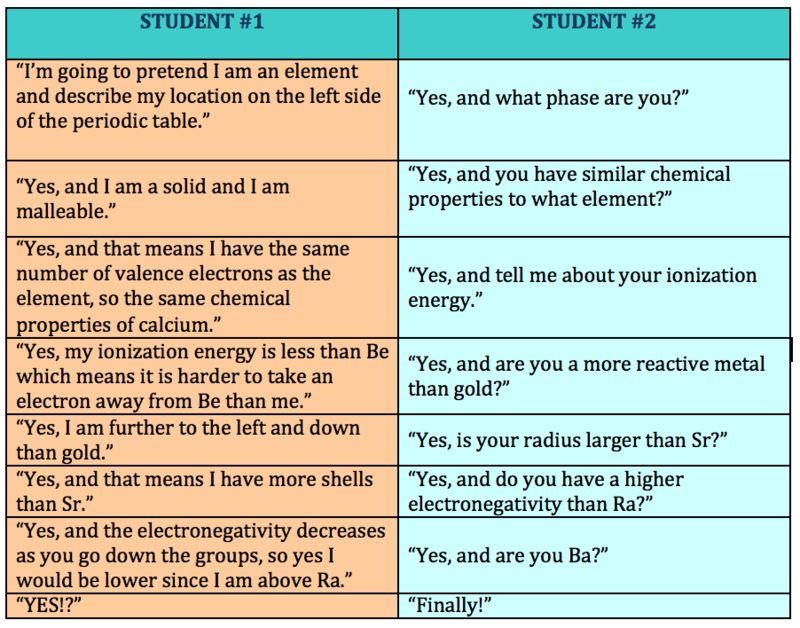 Students then had conversations with each other back and forth saying “Yes, and....” For the periodic table prompt, students were to pick an element and describe its physical and chemical properties to help the other students identify an unknown element. Below is one sequence of interactions between students. Another activity explored at the workshop is called the “hard sell”. Two participants had to improv the following situation: you are a door to door hairbrush salesman and have to try selling a hairbrush to a bald man. I couldn’t believe how the participants jumped in on the spot and created a hilarious exchange. I did this with my students just recently for midterm review, where the students had to describe as many possible uses for a particular type of glassware as they could. I was thinking in honor of the international year of the periodic table, I will let my students pick an element and then “sell it to the class” at the end of the year. An additional activity presented was called the “One Word Story.” In this activity a group of individuals tells a cohesive story one word at a time. It starts when one person says a single word, and unfolds when someone else in the group offers up another word. This can be done by sitting in a circle and going around one person to the next to tell a story. We recently completed a hydrate lab and told a one word story as the report out for the lab. The one word story did not replace the written component of the lab conclusions or report required, but provided a nice closure to the activity. The activity can be adapted to allow students say a few words or a phase for the purpose of time as well as the teacher pointing to random people instead of going in a circle. In summary, improv in the classroom is fun and engaging and a way to get everyone involved. It is sort of awkward at first, but definitely memorable and the students seem to have fun in the process. If you have any other ideas, please comment below.